Hook It Sam 1000 - Thermal Management Sleeving And Jackets - Thermal Management - Products - ZT | Zippertubing Co.
A fire-retardant solution with an aramid Velcro® closure and silicone-coated fiberglass jacket that protects from heat-related issues such as melting wires. 0.5" 0.625" 0.75" 0.875" 1.0" 1.125" 1.25" 1.375" 1.5" 1.625" 1.75" 1.875" 2.0" 2.125" 2.25" 2.375" 2.5" 2.625" 2.75" 2.875" 3.0" 3.125" 3.25" 3.375" 3.5" 3.625" 3.75" 3.875" 4.0" 4.125" 4.25" 4.375" 4.5" 4.625" 4.75" 4.875" 5.0" 5.125" 5.25" 5.375" 5.5" 5.625" 5.75" 5.875" 6.0"
Due to the array of diameters and customization capabilities that Hook-It® (SAM-1000) offers, the possibilities for its use are endless. Hook-It® (SAM-1000), a flame-retardant product, is composed of materials, which make it one of the most practical products for use under the hood of an automobile or in other areas where heat protection is imperative. Hook-It® (SAM-1000) has a jacketing made of rugged, aluminumized, silicone-coated fiberglass and an aramid hook-and-loop closure. It is sewn using one of the highest heat-rated materials we offer: Kevlar thread. With these materials, the product can withstand 350°F of continuous heat. Not only does Hook-It® (SAM-1000) protect your valuable components from heat, but it also has a sleek appeal that is sure to make any engine compartment shine. This product can be used for a multitude of applications, including shielding wires, hoses, or cables inside an engine compartment from heat. It can also be installed around fuel lines to reduce the possibility of fuel line vapor lock or even reduce intake temperatures. Due to the array of diameters and customization capabilities that Hook-It® (SAM-1000) offers, the possibilities for its use are endless. If you are in need of a heat-reflective or thermal management product and don't see it on our website, never fear. Zippertubing offers custom, one-off engineering that will exceed your expectations. 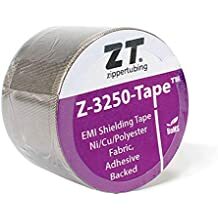 Whether you are looking for a simple thermal cable bundling product or something to handle harsher temperatures, it’s time to contact The Zippertubing Company! *When trimming the length of any sewn product, we recommend sewing the new ends if the product. 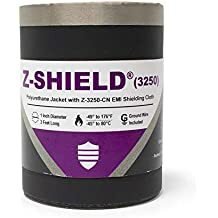 When cutting this product, we also recommend using Kevlar thread to resew the ends to ensure the product retains its original thermal properties. Cable Diameter 0.5" 0.625" 0.75" 0.875" 1.0" 1.125" 1.25" 1.375" 1.5" 1.625" 1.75" 1.875" 2.0" 2.125" 2.25" 2.375" 2.5" 2.625" 2.75" 2.875" 3.0" 3.125" 3.25" 3.375" 3.5" 3.625" 3.75" 3.875" 4.0" 4.125" 4.25" 4.375" 4.5" 4.625" 4.75" 4.875" 5.0" 5.125" 5.25" 5.375" 5.5" 5.625" 5.75" 5.875" 6.0"
SAM-1000 is a heavy weight; Silicone impregnated fiberglass fabric with a heat reflective Aluminum Foil surface laminated on one side with a high temperature adhesive. The combination makes SAM-1000 a flexible and durable heat protection jacket material with outstanding abrasion characteristics. SAM-1000 is best in moderate temperature heat barrier applications where a mechanically tough jacket is required. The material has a thermal effectiveness value of 69+°C when tested to SAE J2302 requirements. These characteristics make SAM-1000 an ideal choice for under hood applications in the Automotive, Truck and Bus industry. The material has an operational temperature range of -50° to 240°C. Material Thickness Variance -0.003" to +0.005"
Soft multi-ply Kevlar sewing thread for machine sewing. Kevlar exhibits outstanding mechanical strength and excellent heat resistance. It also is resistance to bacteria, mildew, abrasion and aging. It has good resistance to most organic solvents. The thread meets the requirements of A-A-55195, Type I (formerly MIL-T-44100).